The Lents Farmer: Ripping out Laurels is Hard Work! When I first moved into my home in 2006, I was given three seedling Laurels for free. At the time they were tiny and barely took up any room in the flower boarder. It seemed like they would never reach the top of the fence. Eventually, as Laurels are want to do, they grew up and out towards the grass and made mowing the grass harder. I constantly had to trim all the new growths back so that I could get the mower and edger past them and had to trim the sides to keep them in check. It was constant maintenance. Then they got so tall that I couldn't reach the tops easily and the tops began spreading out wildly. When I first planted them, I had this bright idea that they would eventually cover the neighbor in the duplex's windows that looked directly down into my house and yard. 2013 - Headed towards the second story of the duplex. The Laurels doing their job covering the windows. By 2013, they were reaching the second floor of the neighbors and were way out of my reach without a ladder. I began having visions of being 90 years old on a ladder, hacking Laurels back. A few weeks ago, I decided it was time to take them down to the height of the fence, so out came the loppers and I gave them all a flat top. I filled up four green bins with the tops of the three shrubs. I wasn't 100% happy with the new look, but figured they were at least now easier to contain/maintain. I hear the "boxy" look is very "in" at the moment! Looking better - Easier to control at least! After living with them at their new height for about two weeks, I decided to remove two of them. I was wondering through Xera one Thursday after work and there were too many cool plants I decided I could plant where my Laurels were. Rhone Street Garden was also talking about removing an old Laurel so that was my inspiration too. Out they were going to come! Center Laurel is gone and the trunk of the left one is still in place. 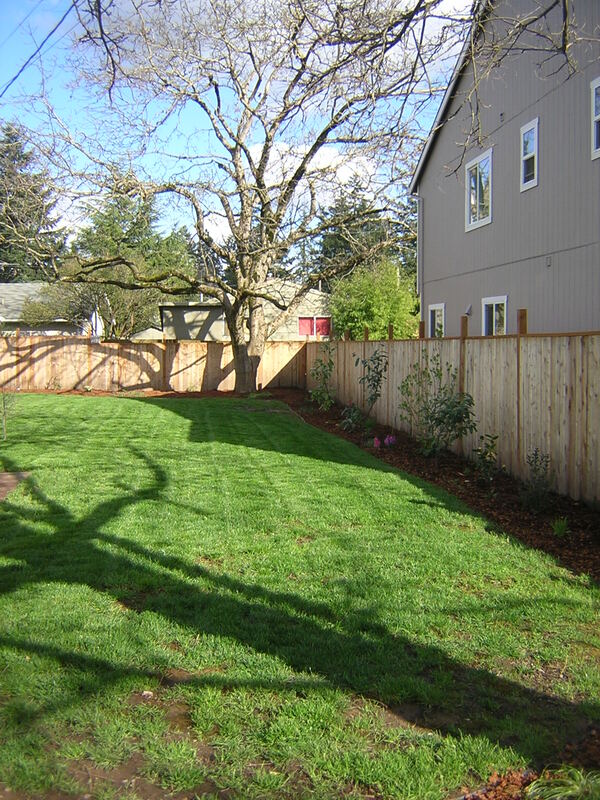 I started with removing the remaining foliage of each shrub, leaving the trunks at the fence height. Only one shrub had a single trunk, the other two had multiple smaller trunks. The bark was raked away at the plant base. I got the shovel, hand clippers and loppers ready for action. Beginning to dig around the trunk circumference looking for side roots. The folks at Xera gave me some good advice regarding root ball removal. Leaving the trunks tall was good for rocking the root mass back and forth. Rocking the trunks helped identify where roots were still anchoring the trunk. Then a little more digging with a shovel/trowel to locate more roots and then cutting them with the clippers or the loppers. The clippers seemed easier and safer for me than using an axe or a pickaxe. Eventually, I was able to free up the root balls and pull out each of the trunks. They, fortunately for me, tended to grow out more sideways and not downwards, so after about 45 minutes per stump, they were history. In one of the spots where a Laurel had been, I moved a Prostanthera lasianthos (Victorian Christmas Bush) that I had planted in a most inappropriate spot. When I read the plant tag initially, I thought it was 10-18 INCHES tall. Turned out at later re-reading and after I had planted it, to be 10-18 FEET tall. Prostanthera lasianthos is marginally hardy here in Portland, so although it sailed through last winter perfectly fine and flowered this summer, it needed to be moved to a better spot if it wasn't going to croak. It may turn out to be just as much work as the Laurels, but it's much more interesting. Paul Bonine of Xera suggested the Callistemon viridiflous and Vites agnus-castus 'Sensational'. I fell in love with Grevillea juniperina 'Pink Lady easily and with no help all all from Paul. I still have to come up with some new shrubs to replace the third Laurel - Any suggestions? Wow, it sounds like you got your workout! I took out one a few years ago, and never looked back. This year, I have on my list to remove a giant (and sorely misplaced) Rhodie. Ah - the new available space will be magical! I like Paul's idea of the Chaste tree. They are so cool, have an interesting history, and have beautiful flowers when you need them the most. That was one of his reasons for recommending it - it's bloom time. Also that it was good for butterflies and could be kept smaller by whacking in spring. I had no idea it would be useful for my PMS (Pissy Male Syndrome) too! With so many interesting choices I predict more of the utilitarian standbys like laurel disappearing from the scene...but the work involved could be a deterrent. Kudos to you for taking it on. The more I thought about them, the more I disliked them. Especially with the availability so so many new cooler plants. The Laurels were good for covering up the fence and staying green in winter, but that's about it. Such a lot of work! Poor English Laurel just wants to be a 30 foot tree and looks interesting grown that way. You've saved yourself years of trimming!